Our policy has always been to involve the local community as much as possible, all the bricks for the new build, like the original school, the clinic and the maternity wing before them, have been made on site by members of the village. The actual building was carried out by local tradesmen and our project manager for the build was a former pupil of the school whom we have supported through secondary education and college where he has gained qualifications which now allow him to manage such projects. The new extra classrooms will allow the school to extend its provision to middle school/secondary education which would enormously develop the career prospects of those pupils aged over 11. 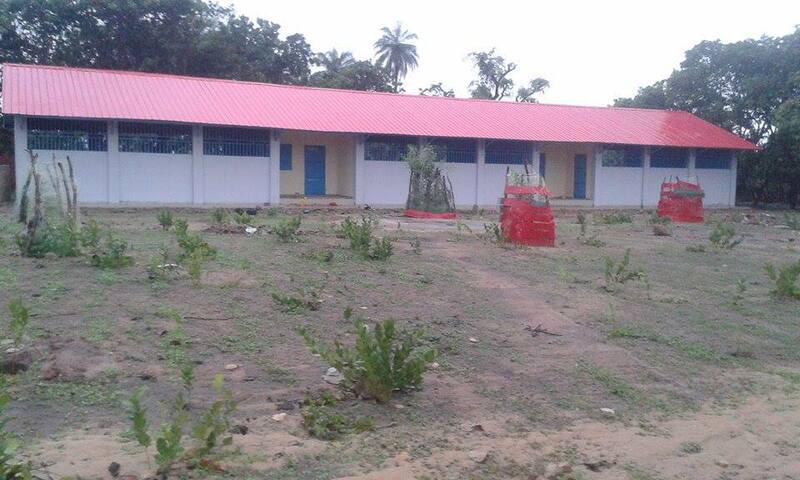 Having visited Nyofelleh in November to examine the progress of the building of the new classrooms it became apparent that a major additional benefit to the students would be the installation of a computer suite which would bring 21st. century technology to a 3rd world village in The Gambia. There were two major obstacles to overcome, there was no piped electricity in the village and we had no access to a supply of computers ! Hence my article in January requesting unused laptops from the readers of the Bramley. I had hoped for 5 or 6 responses, within a month I had picked up over 50 machines and met a whole host of generous, concerned people who had responded. We have been helped enormously by a couple of volunteers, who themselves donated laptops, with an IT background, who have painstakingly prepared the machines to best suit the needs of the students and eliminate the data used by the original owners. Recently we have begun the process of exporting the prepared machines to the village. We have been offered space in a shipping container which goes regularly to the Gambia, saving us the high cost of shipping. The provision of basic IT skills to this generation of Nyofelleh young people opens up the potential for them to look beyond becoming a subsistence farmer on a dollar a day to seeking employment with computer skills which offers much higher pay and all-year employment. Thanks go to everyone who donated their old machines, especially the two local primary schools who donated a full set of class laptops each which will form the basis of the first school computer suite. We are now in a position to seek more laptops to supplement and develop the computer suite. We have created a clear set of criteria to avoid working on machines which eventually have to be deemed unfit for export. Laptop Criteria: We are seeking laptops in good working condition, i.e. the lid closes properly, the screen is clear and not cracked, it switches on and off easily, has a complete keyboard with no missing or loose keys, contains a good battery which can retain a charge and a working power cable. It would also help if the original windows installation disc is available, and if there are any access passwords the can either be deleted or recorded on a post-it note stuck onto the machine. We hope to visit the school again in November to see the new classrooms and comuter suite in operation. Without the generous and help and support of the 50 + donors this small idea would never have become reality and given a host of young people the potential to rise from abject poverty and look forward to a future where they will be able to support their families in food and shelter with far more certainty than before. The village asked me to pass on their heart-felt thanks to everyone who donated to the previous request. For further information on our work in The Gambia please visit www.Derek-Bailey-Foundation.org or contact me at the above email address.